This was the largest sunspot group of this solar cycle as it moved with the Sun’s rotation. 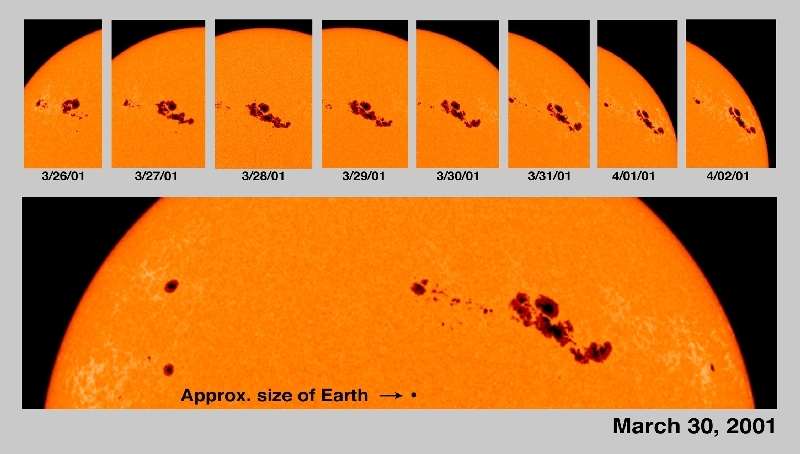 On 30 March 2001, the sunspot area within the group (called active region 9393) extended across an area more than 13 times the diameter of the Earth It yielded numerous flares and coronal mass ejections, including the largest X-ray flare recorded in 25 years on 2 April 2001, the last image in the series. Caused by intense magnetic fields emerging from the interior, a sunspot appears to be dark only when contrasted against the rest of the solar surface, because it is slightly cooler than the unmarked regions.